Heeft u een vraag voor Villa Paradise Hikkaduwa? 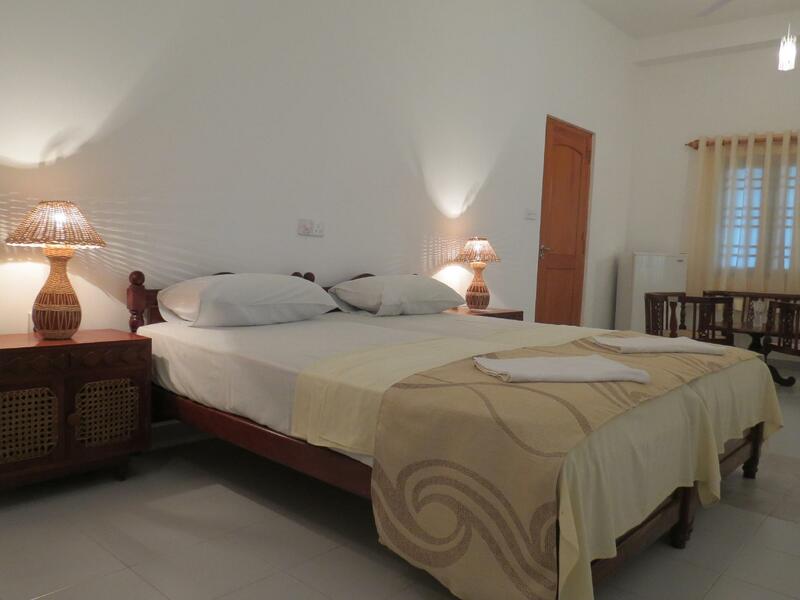 Of u nu een toerist bent of een zakelijke reiziger, Villa Paradise Hikkaduwa is een uitstekende accommodatie tijdens een bezoek aan Hikkaduwa. Het stadscentrum is slechts 1.8 km verwijderd en het vliegveld kan worden bereikt binnen 180 minuten. Dankzij de praktische locatie liggen alle belangrijke trekpleisters in de buurt van het hotel. Profiteer van de ongeëvenaarde dienstverlening en voorzieningen in dit hotel in Hikkaduwa. Het hotel heeft een uitgebreid aanbod aan services, inclusief wi-fi in openbare ruimtes, parkeerservice, parkeerplaats, roomservice, vervoer van/naar luchthaven. De ambiance van het Villa Paradise Hikkaduwa weerspiegelt zich in de inrichting van de kamers. internet (draadloos), rookvrije kamers, airconditioning, bureau, minibar zijn slechts enkele van de faciliteiten die u ter beschikking staan. Het hotel biedt fantastische faciliteiten, inclusief tuin, zodat u kunt onthaasten na een bezige dag in de stad. Wat de reden van uw bezoek aan Hikkaduwa ook is, het Villa Paradise Hikkaduwa is de perfecte keuze voor een enerverende vakantie. Well located and near some nice beach bars. Surfing school looked fun. In all honesty this place won’t set your world alight and the rooms are fairly shabby. The staff are pretty laid back and English is pedestrian at best, but on this stretch of beach it is what it is. Right on the beach. Great food at the beach bar. The place was perfect for a backpackers standards. The location is right on the beach. The facilities are clean and kept. If you are looking for a luxury hotel then this isn't it, but if you want a place with a great vibe, awesome location and a clean bed then I highly recommend this place. Friendly staff and a great breakfast. Big room but no hot water. Good wifi. Close to shops and restaurants. Nice place to stay,staff very helpful. Will stay again and tell my friends. ..close to beach. friendly staff. Location.value for money. Easy base so near beach and town. Staff very helpful. Food very good standard plus affordable. Great tuktuk driver who was very helpful to show local sights. We stayed 5 nights in this resort and the staff really let the place down and didn't make us feel at all welcome during our stay. There are many other similar resorts in the area with much friendlier staff. We won't stay there again or recommend it to our friends. it was amazing from the day we got there, always accommodating, very friendly people, sorted us out a good day tour to some tea factory, elephant riding and galle - its worth paying a bit more for the deluxe rooms upstairs - had such an amazing time when i go back to hikkaduwa i will definitely stay there again! I liked the location, the staff were friendly and helpful too. Our stay was really nice, no complaints. Villa paradise is a great budget hotel to stay in. Its bang on the beach so you literally need to step off the hotel lawn and on the beach. The staff is extra helpful. All errands are run by 3 boys and primarily "Buddhika" is your go to person for everything. We stayed 4 nights and felt like home. All shops market are just across the street and all restraunts are just along the beach. Perfect location. This hotel is just beside the beach and is very suitable for those who love swimming. You can just put all your stuff in the room and went out for sun-bathing or swimming. The shower is good. The air-conditioner is cool enough. But there's no restaurant in the guest house. We need to have our breakfast and other dinning outside. This is a very nice Budget Hotel located right on the Beach close to many Beach Bars / Restaurants. 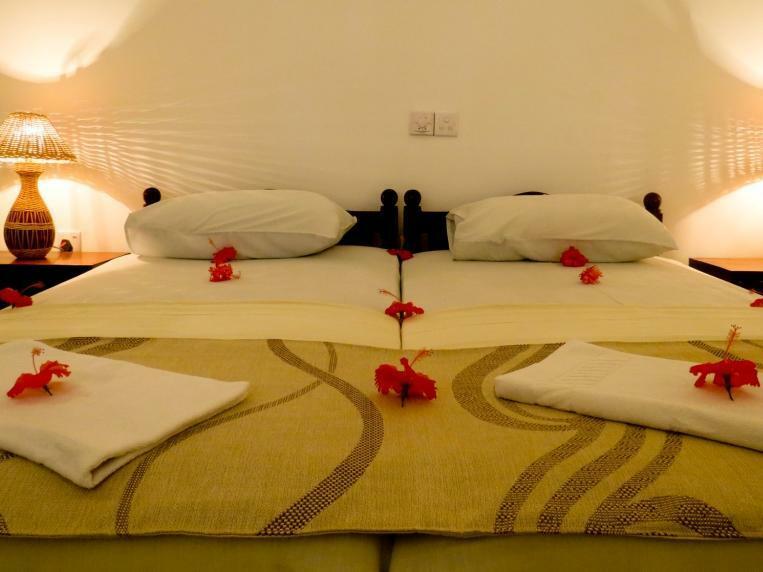 The Rooms are large (very large), clean and with all the basic facilities you need. The staff are very friendly & helpful without being over bearing. This Hotel is excellent value for money. It was just abt ok. We were shown to our rooms, we did not have any beach facing rooms available. The rooms are fairly big and clean. They could do with an extra bed in some rooms... The beach is the best feature. The hotel is atleast 25% more expensive than the other hotels around in the same segment... It is not worth the money considering most of the time is spent outside or on the beach. Staff are not great either. You can easily give this a miss and stay elsewhere in the vicinity.